Rebecca & Marc were introduced to us by the fabulous Duncan Reyes of Duncan Reyes Events. 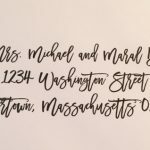 We were happy to work with the couple on both their Wedding Engagement Invitations as well as their Wedding Invitations which were similar in theme. Hyegraph Invitations & Calligraphy also worked with the couple on their Wedding Calligraphy, Wedding Menus, Wedding Place Cards & Wedding Programs. 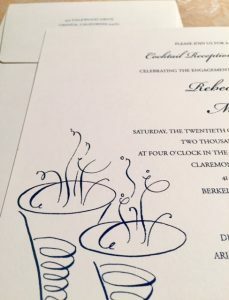 The above Engagement Invitation Card is in Thermography printed Navy Ink. The Type style is Bickham Script and Garamdond upper case. Marc & Rebecca chose a Bavarian-European Flap Envelope with solid Navy Lining. 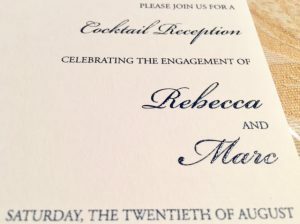 Please see Rebecca & Marc’s Wedding Invitation on our Blog. 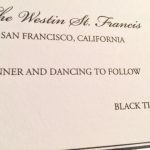 You can order similar invitation at Hyegraph Invitations & Calligraphy or online. 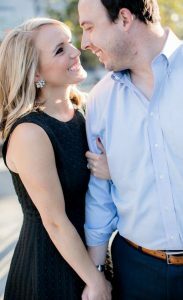 Marc & Rebecca’s Engagement took place in August of 2016 and their Wedding took place in April of 2017. The couple’s photographer is Clane Gessel.